Koha is an Open-Source Integrated Library System (ILS). Koha is web-based multilingual Integrated Library System to cater to the automation needs of medium to large libraries.It is used by over 5,000 + academic, public and special libraries across the world.VLIB.IN offers customized version of Koha.To know more..
Access our demo with below credential. Registration is open till date 31-December-2018, so get hurry to take 6 month free cloud server access. Koha satisfies all the functional requirements of a library management system. It is full-featured MARC based integrated library system and is customized to cater to the needs of libraries. •	Allow our high performance cloud server without any cost for 6 month. •	Customizing Library system as per customer needs. •	RFID, E-library and Payment gateway integration. •	Support team will provide training to library staff. •	Will upgrade you time to time, when new features available. •	Support to migrate data to koha library system. •	Allow to download full data backup. Still confused about our features? Get a free for 6 month! 211, Gopal Plaza, Kuber Nagar-1, Katargam Darwaja, Surat-395004, Gujarat, India. Send us your query anytime! VLib.in is cloud library system, It’s make easy to handle whole library books and reader data. The reader can refer, share the review, discuss, exchange and connect as per their book choice. 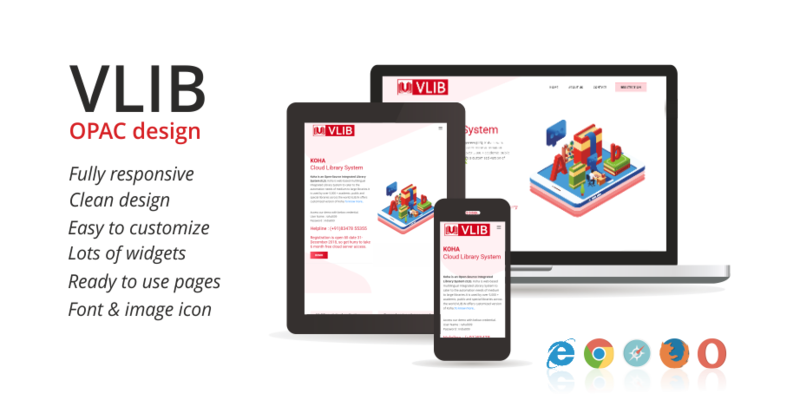 VLib.in is the brand which maintained by the highly qualified developers of the Visione InfoTech software company in Surat, Gujarat, India.